Perhaps you know me personally, or perhaps reading this article is the only introduction that we’ve ever had. 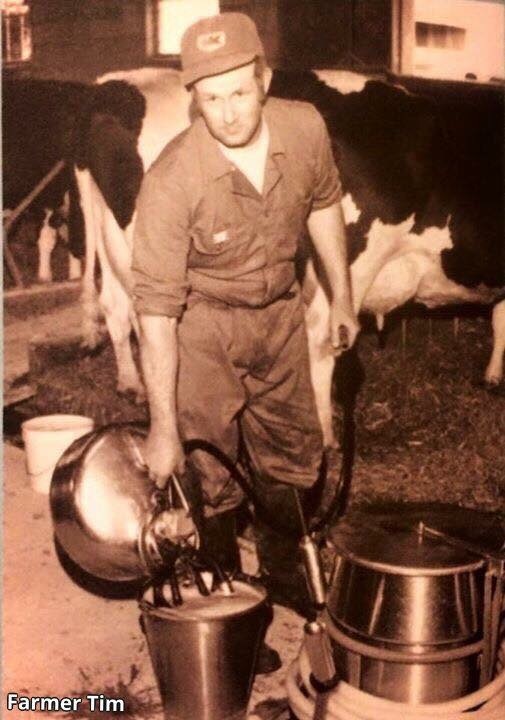 To bring you up to speed, I am a third generation dairy farmer. I am not a lobbyist nor a politician. I buy my groceries at the store like everyone else because yes, I am a consumer too. 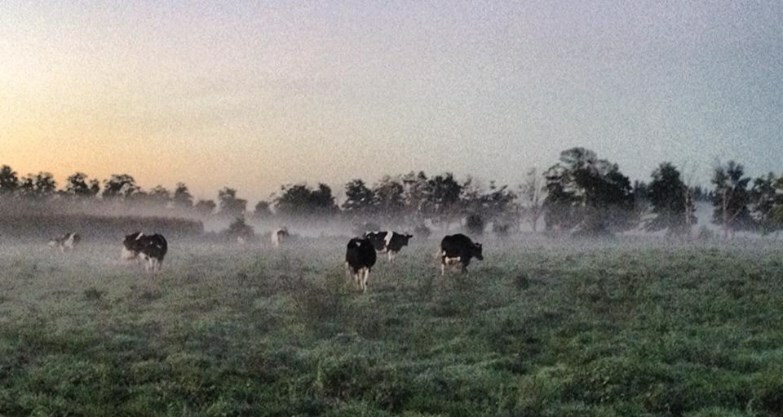 My family has a small dairy farm in Southern Ontario. 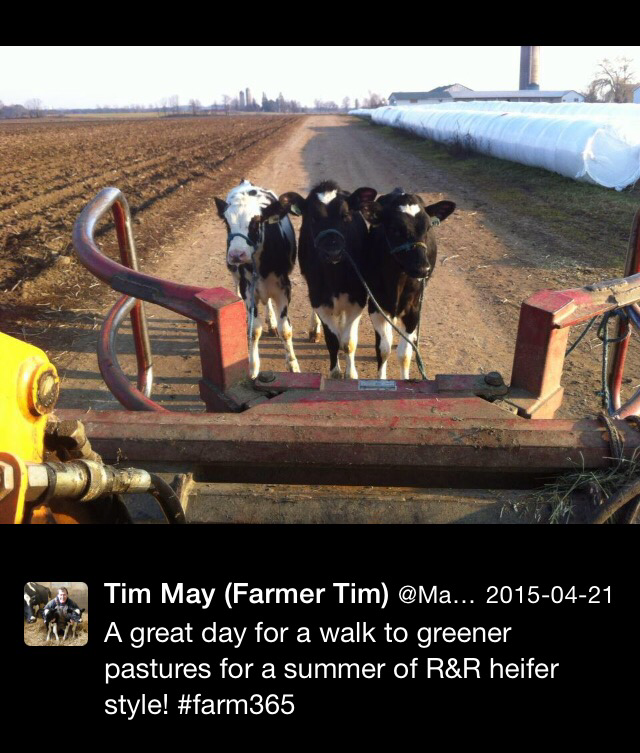 I am proud of our farm and it is a privilege to be able to work with dairy cattle. I started a public Facebook blog early in 2015 to help educate the public, counteract misinformation, and to share my own personal story about dairy farming. I recently branched out by using Twitter to help reach even more people. Overall my efforts have been extremely rewarding; I’ve had great feedback from farmers and non-farmers all over the world. However, I’ve also had some feedback that I never expected. I am very proud of the high standards of animal welfare that we practice on our farm and it is often the core of my posts and tweets. You’d wonder how something so positive could be twisted into something so negative. Yet some extreme animal rights activists have taken it upon themselves to reshare my posts, altering the context to serve their own agendas, all the while hiding conveniently behind false identities. Initially I kept screenshots of these hijackings with the intention of using them in my blog. However I was given the advice not to repost their tweets as it only gives these cowards the attention they crave. So, as a compromise and to give context to this blog, rather than publish the screenshots, I will simply provide quotes. 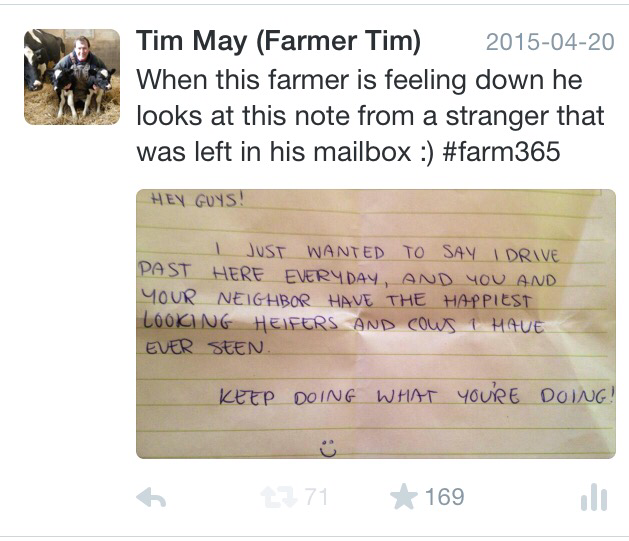 Here is my original posting of a nice letter that was left in our mailbox by an anonymous person. I am so proud of that little note. I keep it displayed to remind me that what I do is noticed and appreciated by others. Next, there is this photo that I shared to show how we walk our calves between our two farms to allow them to enjoy an extended length of time on pasture. They truly have an amazing life here and I was trying to share with the general public our dedication to providing our animals as nice a lifestyle as possible. There are many other examples that I could share with you, but it only saddens me to go further. I almost feel like I am stooping to their low standards by writing this blog in the first place. This experience was a real eye opener for me. I feel violated. I have friends and family that are vegan or vegetarian. I respect them and love them even though we have differing opinions. To be honest, you can learn a lot by putting yourself in someone else’s shoes and by trying to understand their viewpoints. I am all for open discussion and dialogue, but only if it’s polite and backed with educated facts. Feel free to express your personal views, but please educate yourself first and don’t attack me to try to gain a following. There is no reasoning with extremists of any type so it’s not worth my time to engage with them. If nothing else, my experience has actually encouraged me to be more aggressive posting positive things about agriculture. I encourage farmers across the world to stand together and do the same. My grandmother always told me to do unto other people as you would have them to do unto you. The world would be a better place if more people followed that advice. It’s been a while since I graduated from the Animal Science program at the University of Guelph. I miss my time there for many reasons, but I definitely don’t miss writing exams! You would think that I would have escaped the stress and preparation of testing when I finished University and became a full-time dairy farmer. On the contrary, the cows and I have a test about 10 times a year! 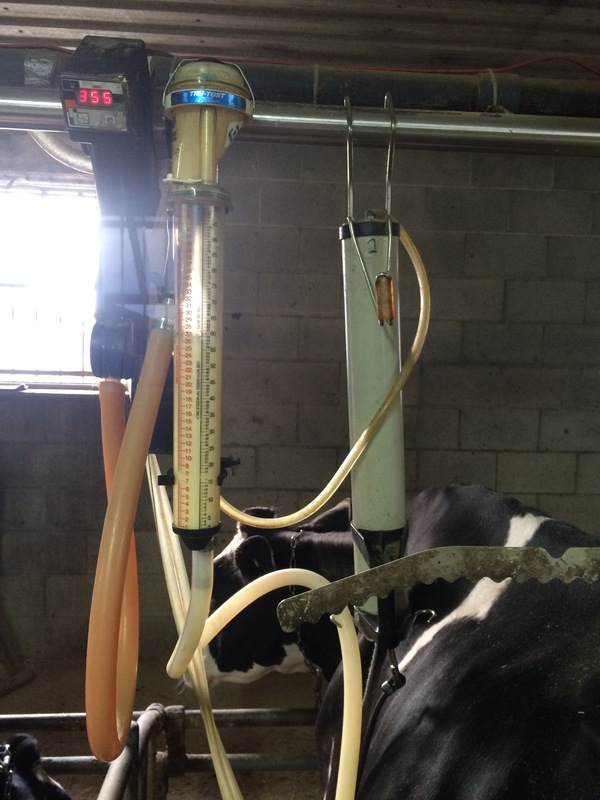 milked, a measured amount of milk drips into the flask to determine how much the cow produced . This number is recorded in a laptop computer. 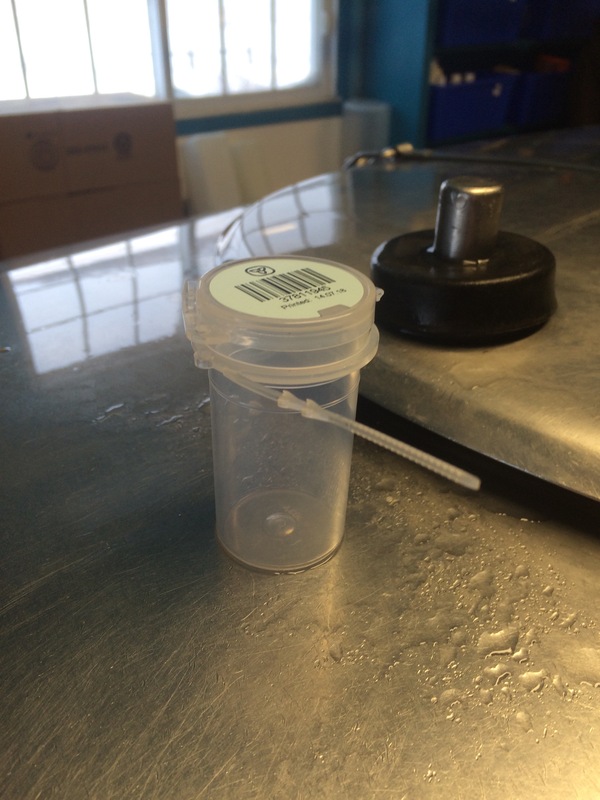 The milk tester then takes a sample of milk from the flask and puts it in a small plastic container for further analysis. At the lab, the milk can be measured for a number of things such as its protein, fat and lactose content. It is also tested for its white blood cell count. A high white blood cell count (Somatic Cell Count- SCC) may indicate a possible infection in the cow’s udder. The lab can also analyse what kind of bacteria caused the infection and then our veterinary can make suggestions on how to treat the potential problem. We can also confirm the pregnancies of our cows by testing their milk. The pregnancy test checks for levels of glycoproteins that are produced during pregnancy. There are also a variety of cattle diseases that milk tests can check for. If you want further information, you can check out the CanWest website. 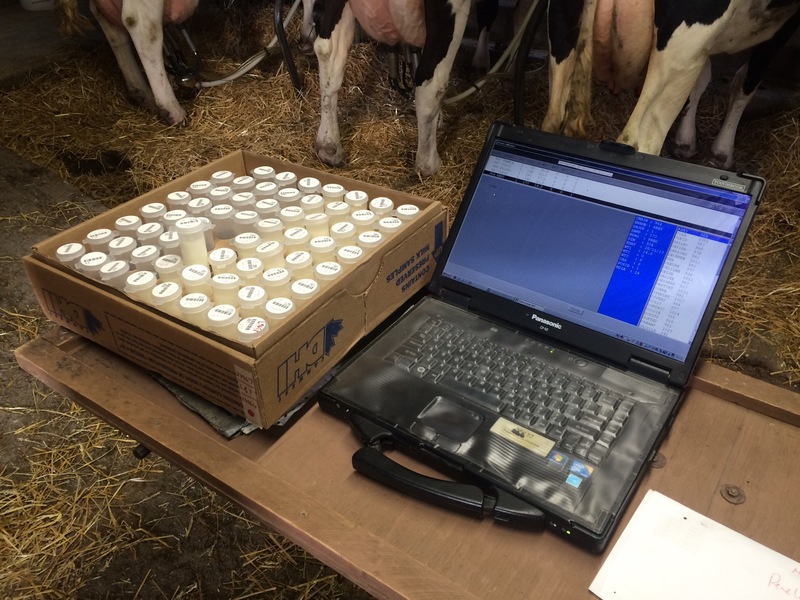 reports are invaluable to a dairy farmer. They give you individual cow production information and trends. They help you set goals to improve your operation and they help keep your cattle healthy through better management. For example, if the milk test indicates that my cows are not producing as much fat in their milk as I would like to see, I could make changes to the herd’s feed ration, or breed low producing individuals to bulls that will hopefully improve production. A bonus to milk testing is that we can have an official production record on each cow. It may be a chore to prepare for routine milk tests, but it is one of the most important management tools that a dairy farmer has. The best part for me is that the cows usually pass their test with top marks and they didn’t even have to study! The girls are thankful that it’s not a psycowlogy, or a cowculus test and they don’t need to use cowculators. Now wouldn’t we all want to write a test where the only prep work was eating as much as you can! Farmers truly are the original stewards of the land. It makes sense that we take out what we put into our land. We all know that livestock farmers have been recycling for eons. We grow crops, the crops feed our animals, our animals eat the crops and the manure that the animals produce goes on to fertilize new crops. It’s a perfect cycle. Did you know that farmers recycle other things too? On our farm we produce giant marshmallows! No, they aren’t the kind that you roast over giant campfires. They are the kind that our dairy cows eat. Harvesting high quality hay for dairy cattle is a complicated process. It requires timing, skill, hard work and a lot of luck. Dairy cows need high protein hay to produce milk. That means that hay needs to be cut young (at early bud stage for alfalfa) and harvested without any rain and at the perfect moisture level. Waiting for it to dry naturally in the sun isn’t always an option. Besides, dry hay can often lose precious protein when its leaves are shattered off during the process. On our farm we cut our hay into rows and bale it up into large round bales the following day at around 50% moisture. If this hay was stored in our barn it would spoil quickly and probably burn our barn down due to spontaneous combustion. This is why we create our marshmallows! Each bale is wrapped in plastic. They can be wrapped individually or in rows. The plastic seals the bale and prevents any air from getting in. This seal prevents spoilage and begins a fermentation process to preserve the bale for future use. An added benefit is being able to keep the bales outside to save on expensive indoor storage. To be honest, the cows love it. It’s like cow candy! Obviously, the plastic is cut off the bale before the cow eats the hay. So what happens to all of this used plastic? Thankfully it can be recycled. On our farm a company picks up the plastic for a small fee. In turn, they take the plastic and convert it into plastic posts for fences or boards for things like picnic tables. So next time you’re sitting around a plastic picnic table think of the plastic from the bale that the cow ate……and of course think of the farmer that grew the hay that the cow ate….then there’s the manure that grew the hay that the cow ate….and back to the cow that made the manure to grow the hay! Phew! Are you confused yet? I told you that it was a perfect circle of recycling. That’s one important little bottle! Have you ever worried about the quality of the milk you just purchased from the store? Are you filling your families bodies with harmful bacteria, chemicals, or antibiotics? I am here to put your minds at ease. Every second day, a milk truck picks up the milk from our farm. It is visually inspected and smelt by the driver who is a trained milk grader before it even leaves the tank. Our farm is required to have a Grade A status, a liscence and meet strict guidelines before we can even think about shipping our milk. More recently, all dairy farmers must complete and maintain records through a new CQM (Canadian Quality Milk) program. We also get routine and surprise inspections to keep us on our toes. Its a lot of work, but it is for the benefit of everyone. Dairy farmers follow careful milking procedures and sanitization protocols every day and the milk is cooled to approximately 4 C at the end of each milking. Everything from the rate of cooling, to the temperature of the cleaning cycles are closely monitored electronically so that farmers can prevent problems from occurring. We work closely with veterinarians. If our cattle get sick, we must adhere to strict protocols and withdrawal times for antibiotic use. Also, in Canada it is against the law to give cows hormones to increase their milk production. Most importantly, a milk sample is taken from every tank of milk that is picked up from a dairy farm. The milk is sealed in a bottle (just like in my photo) with the farm’s identification number on it. This milk is tested for a number of things. Firstly, it is tested for the amount of fat, protein and other solids that are present. 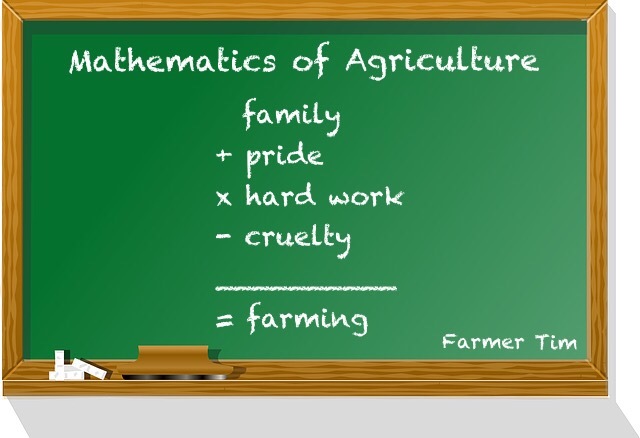 These results are used to help determine what we get paid for our milk. Secondly, the milk is tested for bacteria, somatic cells (white blood cells), antibiotics and the freezing point. There is bacteria on everything around us and that is why milk is pasteurized. Even the cleanest, and best managed farms have potentially harmful bacteria in their milk so it is never wise to drink raw milk before it is pasteurized. In fact, it is illegal for me to ever sell you raw milk straight from my cows and I would never think of it. Why take the chance? 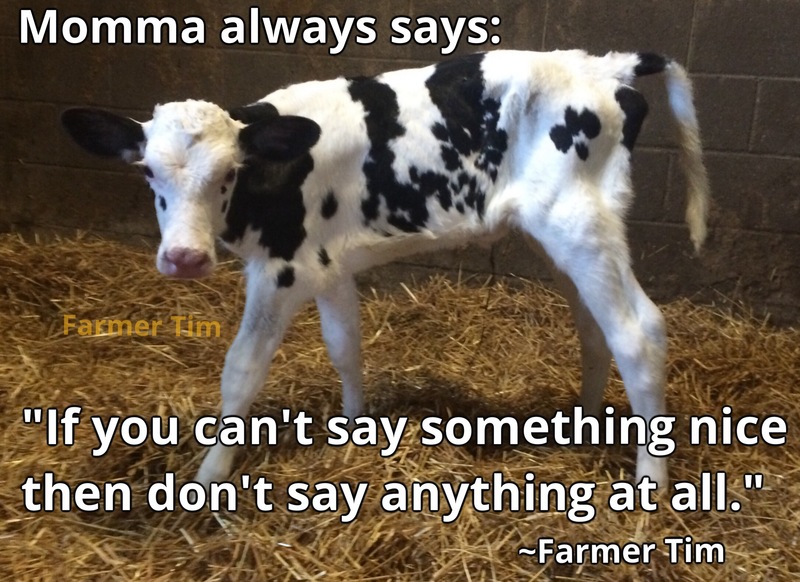 Thankfully, somatic cells are present in our bodies and in our cows to help fight infection. They are a natural part of milk, but if the number of cells gets too high, it may indicate a problem. There is a limit to the number of somatic cells and bacteria that is allowed in the milk we produce. Heavy fines are put in place to penalize farmers that go over the set limits and their milk will not be picked up until the issues are addressed. Antibiotic residues are strictly prohibited. If a test indicates that the milk has antibiotics, the entire truck of milk will be discarded. The freezing point of milk is -0.54C. If the milk varies significantly from this number, farmers are fined because it could indicate the presence of extra water in the milk. Finally, the processors also take a sample of milk from each milk truck that enters their dairy as a double safeguard. I hope that I have eased any concerns that you have about the quality of the milk you may consume. Canadian milk is one of the purest and safest foods on the market. As I always say, farmers are consumers too. My family proudly buys and drinks the same milk that you get from the grocery store so lets all take a glass of milk and make a toast to celebrate Canada’s dairy industry!